This young leader faces a big dilemma. Her story will inspire you. Chanthy is not average. She's really quite amazing and unique. She's an example of why we want to empower and release Cambodians to lead, rather than relying on the tired model of foreigners controlling the wheel. As Stephen Jay Gould attests in the quote to the right, there are extraordinary people hidden just out of sight at the margins of society. Chanthy is a farmer's daughter with exceptional energy and capacity. Though few, perhaps, are quite like her, many capable yet unrecognized Cambodians are ready to love and lead in surprising ways. Four months ago, Chanthy gathered a dozen or so youth from the rural church she pastors, and they all became Alongsider mentors together. She is the small group leader. On the day they officially signed up, she was charged with excitement as her new little sister stood beaming beside her. Chanthy, left, with six of the new Alongsiders from her community. That evening she returned home after dark and helped her parents tend a tremendous pot of curry simmering over coals outside their house. It cooked all night, and the next morning they rose together before dawn to crack coconuts and squeeze the pulp, shell garlic, and add the final spices. About 6:30 a.m. people began arriving and leaving with enough delicious food to feed their families. They fed more than 200 people that day. Chanthy's family isn't rich. They saved for months for that day. It was during the week of P'chum Ben, one of the most important Buddhist festivals in the country. As devout Buddhists, Chanthy's family had brought food to the local temple every year and given it to the monks. In theory, the food they gave was supposed to help feed the poor, but that didn't always happen. After coming to faith in Jesus, the family decided to continue to tradition, but they elected to give food directly to the poorest families in their community. This year was the first time they tried it. Chanthy had come to faith first. She walked over to the Christian church to learn what Jesus was about, and she never turned back. That was just over a year ago, and it didn't go over well. "My parents scolded me," she says. It must have been a serious scolding, because she moved out of her home and slept at the church for three months. But it was her parents who relented, and soon after her whole family put their trust in Jesus as well. Chanthy is a force that's hard to resist. At some point in her life she developed a very strong character. She was born in a refugee camp in Thailand. Her parents had fled there when Vietnam invaded Cambodia in 1979, and they stayed for the next twelve years. When the family returned to Cambodia they erected a shelter on a piece of land in an isolated village north of Phnom Penh, and they began the nearly impossible task of starting from nothing as rice farmers. After some years of hard-scrabble existence, the family desperately needed a break, and Chanthy provided it. She went to Malaysia, where she took a risk, employing herself as a nanny for a rich family. Many Cambodian nannies have endured tragic abuses, but fortunately Chanthy was hired by a good family. They paid fairly, and she even got to travel to Japan and Korea with her employer on business trips. When she returned home, she gave all the money she had saved to her parents, and they used it to build their house. Now Chanthy is the assistant pastor at her church. The "real" pastor, she explains, lives in Phnom Penh and visits once a month. She doesn't receive a salary. She rises at 3 a.m. daily to help fix food for the family. Then she goes to a nearby high school where she spends the morning selling snacks to the students. She makes about $1.25 each day. On Sunday she drives a wide loop on her motorcycle and visits five "house churches." On the way, she buys a huge load of snack food using her earnings. 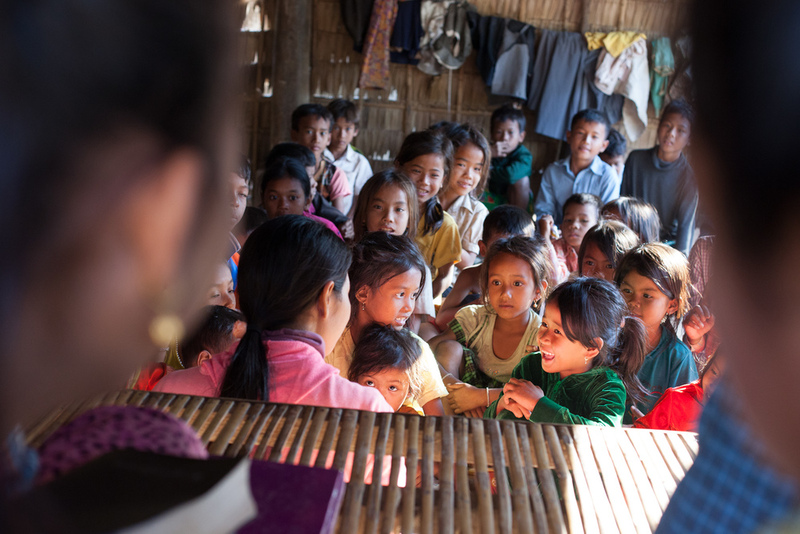 At each stop, a crowd of children gather and listen to her share from the Bible. A few adults hover nearby, some listening and others idly chatting. When she finishes teaching, she distributes the snacks and moves on. Chanthy teaches young children from the Bible. Afterward a group of older youth took their place and Chanthy led them through a more advanced version of the same teaching. Chanthy is learning how to teach the Bible at a Bible school in the nearby city, and each week she teaches what she recently learned there. "I love children," she says, and she repeats herself until she is sure she has made herself clear. "I really love children. People ignore them and treat them badly, especially poor children, but I love them." But later she admits she dreams of leaving the countryside, and she worries what will happen to the children without her. She points to the beauty all around and flatly states that she hates the crowded streets and noise of Phnom Penh. But she wants to learn more and expand her life. She feels, well, marginalized. "I'm not doing anything here, she says, oblivious to the incongruity in her words. Herein lies the challenge. The big dilemma. Alongsiders is working with young leaders at the grassroots. They are doing things and going places foreign workers and even Cambodians schooled in the cities could hardly emulate or follow. Yet they live in a world that tells them relentlessly, just as it tells us, that they are insignificant unless they land a particular kind of job or reach a certain status. If they shine as leaders, there are companies and big-budget organizations that will hire and take them away. But we will not be discouraged. Right now the work of enduring beauty and significance in the Kingdom of God is being done by Chanthy and her fellow Alongsiders! We often celebrate the children of Alongsiders - the little brothers and sisters - but today we're grateful for the Alongsider leaders and mentors, who are more often than not young men and women who have grown up at the margins themselves. May we have eyes to see them, a vision that includes and expands with them, and a willingness to trust them with it. And let us learn to walk with them without using or corrupting them (and that, in itself, is a challenge worthy of writing about another day). Thank God for them, and pray that the Lord of the Harvest - who must have an affinity with farmers judging by the way Jesus taught and talked about Him - will raise up more amazing and unique leaders to serve as Alongsiders.